Note:- Age proof may be require at the time of entry) With Complimentary Buffet Dinner and attractive Souvenir. Indian Railways has been one of the most prominent means of transportation for the country for past two centuries. Indian Rail Network is one of the largest in the world. We all must have travelled by a train some time or the other. But do we know how it functions? What technologies are used to operate the rail network? What kind of evolution has railways seen in the past? If you are curious to know answers to these and more questions related to the Indian Railway Network, you must visit National Rail Museum. This unique museum features a collection of some 100+ real size exhibits of Indian railway. 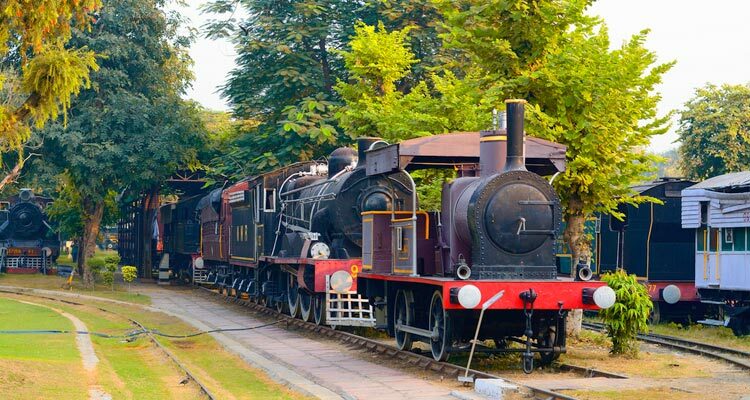 National Rail Museum is spread over an area of 11 acres and offers a treat for not just only kids but a learning experience for elderly people too. The National Rail Museum comprises of India’s railway heritage, exclusive exhibits, antique locomotives, train rides, showcase of technical enhancements done in railways, and a lot more. It showcases both indoor and outdoor exhibits. One cannot miss the toy ride inside the museum, in which the visitors can take a round of the entire museum and get a glimpse of all the exhibits in one go. You can see everything from a Steam Simulator, Diesel Simulator, Coach Simulator, et al during the ride. The Transport Museum was conceptualised in the year 1962. However, it was only in 1970 that the concept took a concrete shape under the advisory of a rail enthusiast called Michael Graham Satow. The concept starting becoming a reality on 7th October 1971, when the foundation stone was laid by the then President V. V. Giri at the site in Chanakyapuri, New Delhi. It took about six years to complete the museum and it was finally inaugurated on 1st February 1977 by the then Minister of Railways Kamlapati Tripathi. The museum had a name change later and was called National Rail Museum after that. The Indian Railway’s heritage: When you walk into the National Rail Museum, do keep yourself prepared for a unique encounter with history. Some of the rarest exhibits showcasing the legacy of British and Indian royals can be seen inside the museum. The National Rail Museum takes you to a journey of 160 years in the past, where you get to see everything from a 1:8 scale train, coach simulator, diesel simulator, steam simulator, different types of signaling instruments, Indian railway uniforms, telecommunications systems used in Indian Railway, antique railway furniture, and even builder plates for the companies engaged in the construction of locomotives. A lot of railway exhibits and infrastructure are displayed to give a true picture of Indian Railways have evolved during the years gone by. One can also find railways artifacts and train models, both in static and working conditions in the indoor sections of the state-of-the-art National Rail Museum. The outdoor gallery: As much engaging is the indoor section of the National Rail Museum, so is the outdoor section as well. The outdoor section of the museum depicts the setting of a railway yard. It houses a variety of engines and coaches including electric, diesel and steam locomotives. This section also showcases a wonderful collection of wagons, armoured trains, carriages, and rail cars. And no, they are not models. There are some original lifesize exhibits, that have been maintained for the visitors to see for ages. Besides, some models of trains are also seen passing through India’s varied terrain in the outdoor section of the National Rail Museum. One can find some of the rarest exhibits like the Fairy Queen, which is the oldest working steam locomotive in the world. The Patiala State Monorail is also seen in the yard, which is one of the few working monorails of the world. The Morris Fire Engine, placed close to the entrance is not to be missed as it is one of its kind running on rubber tyres. 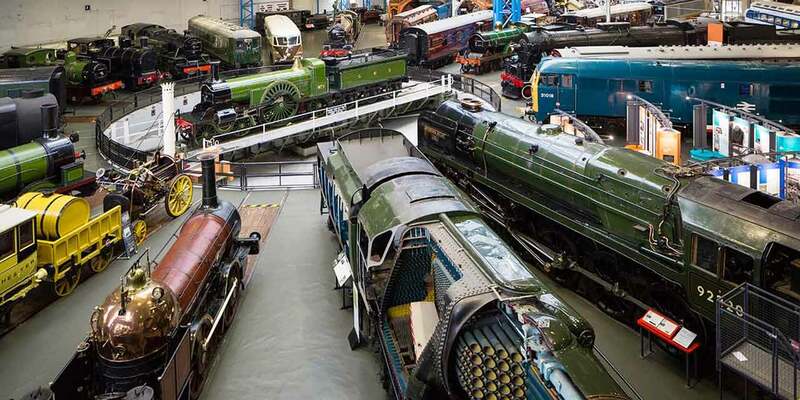 Royal Collection: National Rail Museum gives a fair sense of the royal lifestyles lived by the then Kings and Queens. The vintage locomotives and coaches that are on display include the Prince of Wales Saloon, the Maharaja of Mysore’s Saloon, and the Maharaja of Baroda’s Saloon. Do not miss peeping inside the wagons to get the real glimpse of the elegant royal interiors and the imperial trains of the old times. One can also see the original coaches of Palace On Wheels displayed at the National Rail Museum. Photo opportunities: Getting clicked at the National Rail Museum is an opportunity worth it. Do not miss posing against some of the most exotic and vintage coaches and locomotives. Besides, you can also get a personalised copy of museum’s NRM Times, with your photo printed on the front page. Experience the rides and 3D simulators: Miss the toy train that you used to ride in your childhood? Well, National Rail Museum is all set to rekindle your childhood by offering you a joy ride on the Toy Train. There’s a Toy Train ride in the outdoor gallery of the National Rail Museum that you must enjoy. Besides you can take a ride on the Patiala State Monorail on Sundays. A virtual 3D coach ride is also offered in the indoor section of the National Rail Museum, letting you experience different types of locomotives and coaches. The Rail Restaurant: Your experience of the National Rail Museum is incomplete if you don’t visit the rail restaurant. Inspired by the model train of the Maharaja of Gwalior’s banquet table, there’s a moving train around the restaurant serving you variety of food. Remember something similar being shown in the Bollywood film Ki and Ka? Souvenirs: The National Railway Museum is not just about creating memories but also cherishing them for a lifetime. Do ensure that you buy a souvenir from the museum like a train model, postcards, posters, apparels, books and much more. Miniature India: This is one of the important things you get to see at the National Rail Museum. On the first floor of the museum is Miniature India. It is not Indian Map that you could have guessed. It is a model that shows a lot of important things in India, like Wankhede stadium, Metro, Indian railway network, the dams and the bridges, the Indian road network including the highways. This model gives a broad sense of how India has developed as a country. The National Rail Museum is open from Tuesdays to Sundays. So plan accordingly. The entry fees during the weekdays is Rs 50 per adult and Rs 10 per child. However, during weekends, it goes up to Rs 100 per adult and Rs 20 per child. Tickets for the Toy Train, 3D simulators and other rides have to be taken separately. The staff of National Rail Museum is readily available to help. So do check out if you have not missed anything. Don’t forget to carry a good camera or a camera phone while you visit the National Rail Museum. You will get a whole lot of opportunities to pose. If you do not want to eat in the rail restaurant, there are a whole of eateries around the museum, that you can try. Autorickshaw/Taxi/Cab: NRM is located in the Chanakyapuri area of Delhi. It is very well connected and one can take autorickshaws or taxis to reach there. You can try apps like Ola, Uber and Jugnoo that can make your journey easier. Metro: Dhaula Kuan, INA and Jor bagh metro stations are the nearest to National Rail Museum. You can take cycle rickshaw, electric rickshaw, auto rickshaw or taxi to reach the museum after getting down from the metro. Bus: DTC buses number 47A, 166, 502, 604, 894, 500 and 181 ply to and from the National Rail Museum.